The Welsh Blood Service [WBS] covers the whole of Wales. We collect voluntary, non-remunerated blood donations from the general public. These donations are processed and tested before distribution to hospitals where they support patient care. We also hold blood-derived products (both NHS and Commercial) for purchase by our customer hospitals. We provide an antenatal screening service to several hospitals and offer all customer hospitals specialist laboratory services to assist in the investigation of complex serological problems. The Welsh Transplantation & Immunogenetics Laboratory, within the WBS, provides direct support to local providers of Renal and Stem Cell Transplant Services. 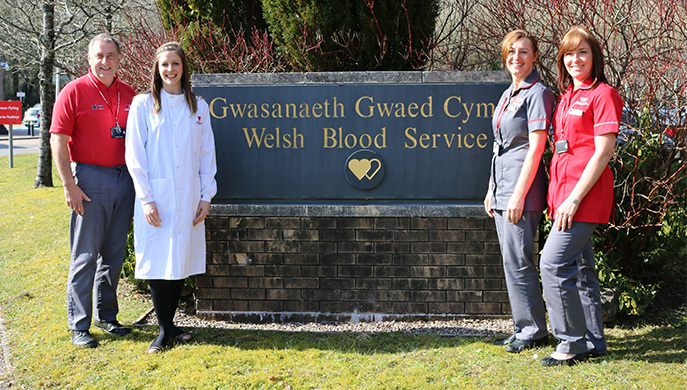 It also operates a national panel of unrelated potential blood stem cell donors – the Welsh Bone Marrow Donor Registry. Medical Consultant support is provided to Hospital Blood Transfusion Committees which includes support in achieving the objectives of WHC (2002)137 Better Blood Transfusion. Clinical advice is provided to customer hospitals as required. We contribute to the maintenance of quality standards in the transfusion and transplantation community by hosting the UK NEQAS external quality assessment scheme for Histocompatibility and Immunogenetics and the Welsh Assessment of Serological Proficiency scheme (WASPS). The WBS is a division of Velindre NHS Trust. The Divisional Director of the WBS is supported by a Senior Management Team. The Velindre NHS Trust Board agrees strategic objectives, and monitors operational and financial performance. There is Welsh Government oversight of the activities of the Velindre NHS Trust. We are committed to maintaining the highest standards of quality and effectiveness. We hold CPA accreditation (Clinical Pathology Accreditation) and we are an Investor in People. The WBS is authorised and licenced by the Medicines and Healthcare products Regulatory Agency, who audit the organisation at defined periods.